"Thors Hammer came from Copenhagen, the Danish capital. Their music was a jazzy progressive rock with English lyrics. Their one and only LP was released in 1971 and holds the sad record of being the most bootlegged LP in Denmark. Until now it can be found as CD editions on four illegal labels (Walhalla, Crystal Emporium Productions, Won-Sin, and Second Life Records), and as an illegal LP reprint (on Phantastic Plastic Records). All these editions were made up very poorly. The now first legal vinyl re-issue is accompanied by a four-page insert in LP size, containing a detailed band history in German, English and Danish language, a comprehensive discography including side and solo projects, cover and label reproductions, and band photographs. It is pressed on 180g vinyl and limited to 1000 numbered copies. 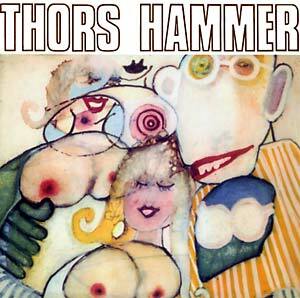 It is the very first LP release of Garden of Delights' sublabel Thors Hammer which, to honour this great band, was named after it. This label is destined for bands coming from outside the German-speaking countries."